The first records of an eruption at Ruapehu were in the New Zealand Spectator and Cook’s Strait Guardian of 8 June 1861, which covered the event of 16 May 1861. 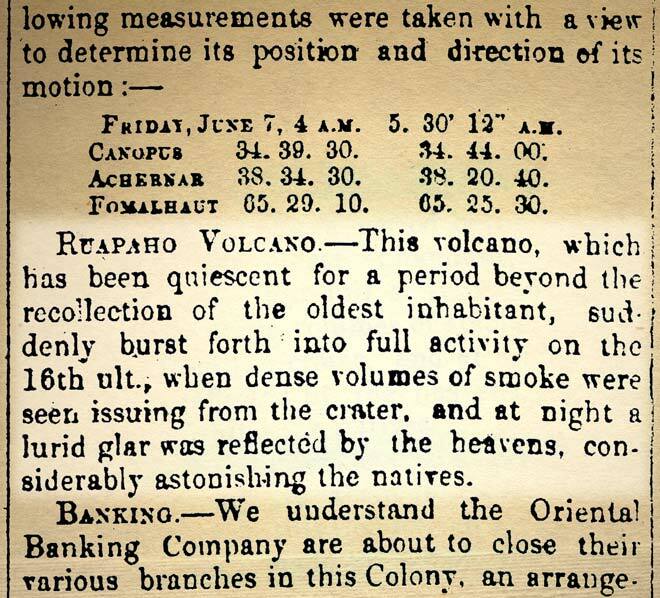 Statements that incandescence was seen at night suggest that it was a large eruption. RUAPAHO VOLCANO.—This volcano, which has been quiescent for a period beyond the recollection of the oldest inhabitant, suddenly burst forth into full activity on the 16th ult., when dense volumes of smoke were seen issuing from the crater, and at night a lurid glare was reflected by the heavens, considerably astonishing the natives.